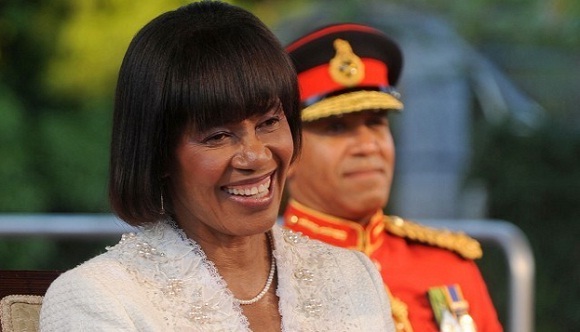 Portia Simpson Miller was sworn in for the second time as Jamaica’s prime minister Thursday, pledging to ease its deep poverty, boost the sputtering economy, heal political divisions and sever colonial-era links with Britain. Simpson Miller, whose 1 1/2-year-long first stint in office ended in 2007, took the oath of office before roughly 10,000 guests on the grounds of the rambling, colonial-style mansion that is the official residence of the governor-general. The 66-year-old politician scored a dramatic victory in last week’s national elections, leading her slightly left-leaning People’s National Party to a 2-to-1 margin in Parliament over the centre-right Jamaica Labor Party. Her opposition faction won a dominating 42 seats in the 63-seat legislature, leaving the incumbent party with 21. The plainspoken, charismatic Simpson Miller, this Caribbean island’s first female prime minister, takes over from Andrew Holness, a 39-year-old Labor lawmaker who was leader for just over two months. “After being tested and tempered, I stand before you today a stronger and better person prepared to be of service to my country and people,” Simpson Miller said at the start of a spirited 45-minute speech. She said her government intends to abandon the British monarch as Jamaica’s official head of state, and instead adopt a republican form of government. Jamaica declared independence from Britain in 1962 but remains within the Commonwealth and has Queen Elizabeth II as head of state. She vowed her government will “ease the burdens and the pressues of increasing poverty, joblessness and deteriorating standards of living” while also pursuing a tight fiscal policy and forging strong partnerships with the private sector and international partners such as the International Monetary Fund. “My administration will work tirelessly that while we try to balance the books we balance people’s lives as well,” Simpson Miller said. Jamaica is a cash-strapped island with a punishing debt of roughly $18.6 billion, or 130 per cent of gross domestic product. In the short- and medium-term, the prime minister said her administration will use “state resources” to stimulate jobs through the Jamaica Emergency Employment Program, a centerpiece of her party’s campaign manifesto. Her People’s National Party said it will try to renegotiate roughly 25 per cent of a troubled $400 million road program financed by China in order to transfer some of the money to the emergency employment program as a way to kickstart the economy. The prime minister also urged Jamaicans to create a more civil and respectful society and earnestly strive to make the best of themselves. “We will seek to make this country one of brothers and sisters, not of rivals and victims,” she said.